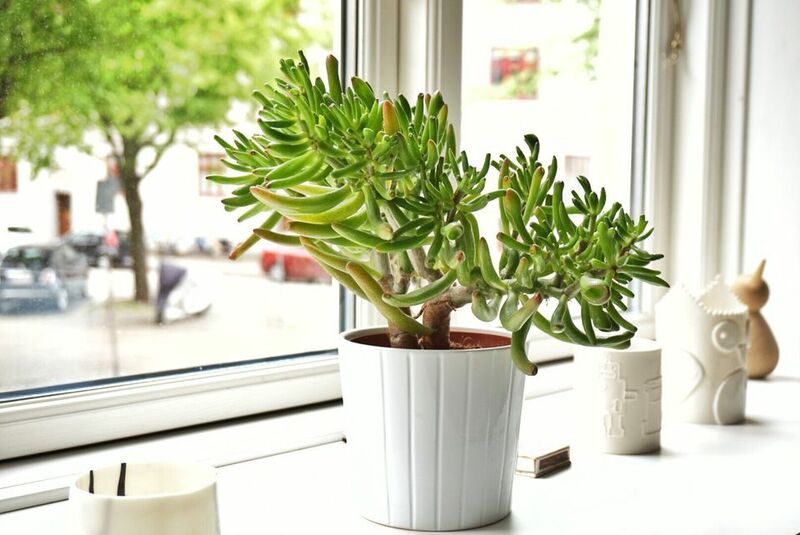 The jade plant is an extremely popular succulent houseplant. Sometimes called the money plant or dollar plant, these plants were once thought to bring good luck to their owners so were often given as housewarming gifts. Jade plants belong to the Crassula species and are generally undemanding. There are several species that are sometimes seen labeled as jade plants in garden centers, but they share cultural requirements. They need an even hand with water and plenty of light to develop their full potential. Jade plants prefer full sun and like four or more hours of sunlight each day. They are best in a room with south-facing windows. During the summer and spring, jade plants should be watered often so the soil is moist but not wet, making sure drainage is immaculate. Reduce watering to monthly in the winter. Jade plants prefer average summer temperatures of 65 F to 70 F. In winter, cool to 50 F.
A well-drained succulent mix is best, with an ideal pH around 6.0 (slightly acidic). Many people underfeed their succulents during the growing season. Feed with a controlled-release fertilizer in the beginning of the season or weekly with a weak liquid solution. Use a balanced 20-20-20 fertilizer at one-quarter strength on mature plants, and a fertilizer with less nitrogen on young plants. Jade plant is known for its ease of propagation. Plants can be easily propagated from a single leaf. Sprout leaves by placing them into a succulent or cacti mix, then covering the dish until they sprout. Place the plant in its new pot and backfill with potting soil, spreading the roots out as you repot. Leave the plant dry for a week or so, then begin to water lightly to reduce the risk of root rot. Several species of Crassula are identified as jade plants in the nursery trade. The standard jade plant is a C. ovata, which also goes by the names C. argentea and C. portulaca. Variegated varieties have been introduced, such as C. ovata "Tricolor." Variegated jade plants need full sun to develop their full coloration. Other varieties that are sometimes sold as jade plants include C. arborescens. Jade plants are easy to grow, but they are susceptible to mealy bugs and fungal diseases. As with all succulents, overwatering is sure to be fatal, so err on the side of too dry rather than too wet. Never let your jade plant sit in water. If you water from beneath by letting the plant sit in a saucer of water, make sure to pour off any excess water after a few minutes. Given proper conditions, the Crassula will flower with white flowers in the late winter, making an attractive and mildly fragrant display.